Closing of Two Gents is Sunday at 4pm! It's a double bill for tomorrow, Sunday Sept 4th! At the beautiful Pelham Bay Park in the Bronx, right off the 6 train. At 4pm we have our closing performance of Two Gentlemen of Verona, followed by a 6pm showing ofJulius Caesar. Both shows are free. Bring a blanket or low chair, a picnic, and a sense of fun! DIRECTIONS: Take the 6 train uptown to Pelham Bay Park. When you exit, go over the pedestrian overpass and come down into the park. Take a right along the path, then a left and keep going. You are looking for the South Meadow Picnic Area, and we are very close to the Dog Run. If you get lost, ask folks where the running track or tennis courts are, since we are just up and over the hill to the right of those spots. Call our hotline at 646-450-2878 if it looks like rain to be sure we are still going on! VOTE for our shows, actors and designers to win the New York Innovative Theatre awards! Find out more at www.curiousfrog.org and Curious Frog’s page on Facebook. Two Gentlemen of Verona and Julius Caesar are Equity Approved Showcases. This Friday, Aug 25th, we continue with Julius Caesar. PLEASE NOTE this performance will start at 6:30pm, a change from previous start time. This performance is actually a debut for our company at this particular venue: Cherry Hill in Central Park. Enter from W. 72nd and CPW for easiest access to this hidden spot, and head toward Bethesda Fountain and go up the hill next to it. Picnic fare can be picked up at Columbus Circle’s Whole Foods if you are up for a walk, but we especially love Westerly Market esp. since they just renovated! Organic produce and packaged vegan and omnivore goods will allow for a unique, delicious dinner. Don’t forget to ask for napkins and plasticware at the cash register, and tell them Curious Frog sent you! On Saturday, Aug 26th, at Inwood Hill Park in Manhattan, we think the rain just might hold for our DOUBLE BILL! 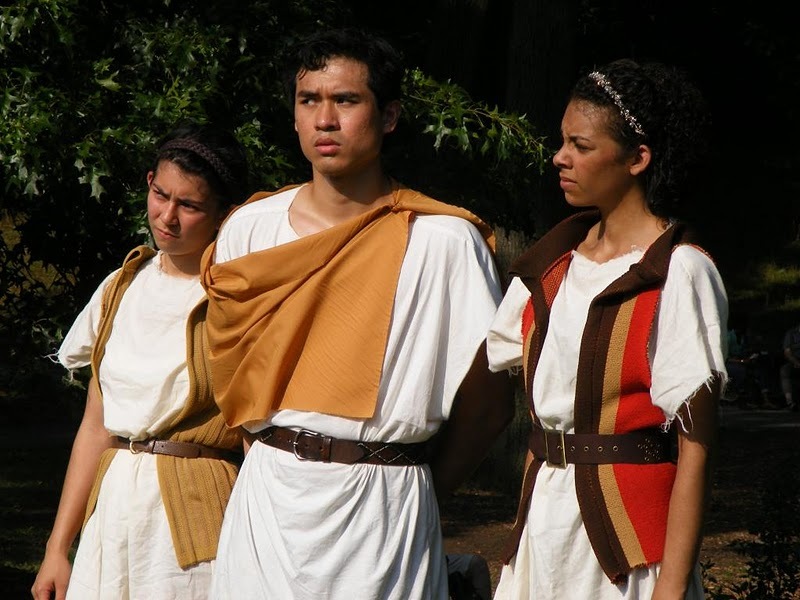 The comedy, Two Gentlemen of Verona, plays at 4pm and Julius Caesar is at 6pm. Both shows play at Inwood Hill Park’s The Peninsula, which is located next to the Nature Center and the baseball diamond on the marsh. You’ll enter at 218th St. & Indian Road, and walk down the wide road and over the little bridge. For this location, we always love to recommend Indian Road Café right there at the corner of 218th St. & Indian Rd, and everyone always says, “What a find!” Indeed they are! Just know that sometimes the wait can be long, so give yourself an extra 30-45 minutes to not just wait, but to make it a full, leisurely day of fantastic dining and beautiful surroundings during a Shakespearean play—or two. As always, look for our chalk arrows on the sidewalks and pathways to lead you to us! Telltale sign that you have found us would be the streamers and balloons to say farewell to Valentine for his trip away from Verona! See you tomorrow and/or Saturday! Bring a blanket or low chair, and sunblock and a rain jacket. Remember to check our phone line at 646-450-2878 if it looks like rain. We’ll let you know by 2 hours before curtain whether it’s a go. This weekend, Curious Frog’s FREE summer Shakespeare opens in Queens with the comedy, Two Gentlemen of Verona. We’ll be bringing you back to 1983 for some fun in the feathered-hair world of shoulder pads and converse shoes. Join us for our preview tomorrow, Friday 8/12 at 6pm on Astoria Park’s Great Lawn, near the water. When you get off the N/Q train at Ditmars Blvd in Astoria, walk down 23rd Avenue until you reach 19th St. If you enter from where 19th St meets 23rd Ave, go down the hill and you should see us there. Telltale sign would be the streamers and balloons to say farewell to Valentine for his trip away from Verona! We perform again, same spot, for our official OPENING the next day, Saturday 8/13, at 4pm. Remember to bring a blanket or a low chair and plenty of hydration! Looking for good picnic fare? We recommend Fresh Start for amazing and unique organic sandwiches, produce, and little tubs of picnic fare—fowl- and vegan-friendly. When you get off the N/Q train at Ditmars Blvd in Astoria, walk down 23rd Avenue and it’ll be on your right, at 29-13 23rd Ave. We love their acai drinks especially! Coming on Sunday at 4pm instead? Sure! We’ll be at Queensbridge Park in Long Island City on that day. Easy to get to as well, since the entrance to this smaller river park is at Vernon Blvd and 41st Ave. The F train will bring you to us, then walk toward the East River, or use www.hopstop.com to find your way from wherever you’ll be starting out from. This particular venue isn’t as close to our favorite dinner haunts as usual, so try to bring your picnic fare with you so you can munch away while you laugh at our antics! See you this weekend! Remember to check our phone line at 646-450-2878 if it looks like rain. As an actor, auditioning can feel like a full-time job. Soon after I wake up in the morning, I read all the casting notices in my email inbox. Once that's done, I make some phone calls, search jobs at the Actors' Equity building, and then of course, prepare for auditions. Most of the time, I see roles that are specifically marked for white actors, while other times the following message is placed as a footnote: “Performers of all ethnic and racial backgrounds are encouraged to attend.”Such a notice would give an actor reason to believe that the casting director is interested in assembling a diverse cast. I, along with other performers of color, respond accordingly and audition for these parts. Months pass, however, and when these roles are finally cast, they usually go to Caucasian performers despite the call for actors of all colors. I respect the vision of the people who made these decisions – the playwright, director, producer, casting director and others – and no one should be forced to cast a show in any way other than how they see fit. On the other hand, I applaud the theatre companies that take risks in casting. I believe the rewards for these risks include the advancement of art in showing the universality in human problems and experiences.Additionally, non-traditional casting enables underrepresented performers to show the range of their talents in works from William Shakespeare to Tennessee Williams and beyond. I am thankful to Curious Frog Theatre Company for the opportunity I had these past couple of months to perform in the play Rope of Sands by Toni Seger. Director, Renee Rodriguez had a vision to cast this upper-class family as interracial even though the play had been performed previously with Caucasian actors.Ms. Seger enthusiastically agreed and was so supportive of the production. My character Peter is the kind of role I have wanted to play for a while – a young professional, educated, sophisticated, but with deeper layers of alcoholism, family strife and an out-of-this-world ego. While I take pride in the roles I've played previously (which include parts in everything from comedies to slave dramas), the diverse casting of Rope of Sands is very contemporary and necessary in this age of Obama.There are affluent African American and multiracial families dealing with the same troubles as successful white families and while this play never explicitly says that, it more importantly shows it. The lack of mention of race brings to mind the film, Things We Lost in the Fire, which stars Benicio Del Toro and Halle Berry as husband and wife. In that film, the ethnicity of the family is never brought up. Similarly, my biracial character in Rope of Sands never says, “Hey Dad, you're black,” or “Hey cousin, you're white,” but what this play does highlight is that this family's troubles are relatable to families of all ethnic backgrounds. I thoroughly enjoyed bringing Seger's work to life under the direction of Rodriguez as well as working with my fellow cast (Barry Phillips and Angela Sharp) and the talented crew. I hope more theatre companies will follow the “leaps” Curious Frog has made in its mission of non-traditional casting. I believe that is the way forward. 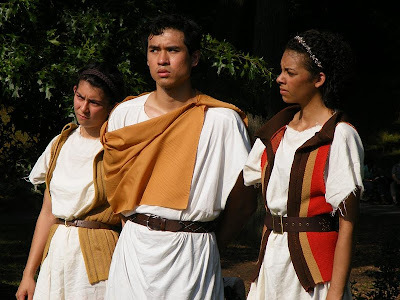 "Forsake thy cage, thy rope of sands..."
At the time I wrote this play, I never would have imagined it being produced with a mixed race cast, but it works beautifully and adds layers for the audience to ponder. The bias I wrote about was financial. Meredith makes less money than her uncle and cousin and all of their communications with her are colored (small pun intended), by that bias. Adding the element of race, however, compounds the questions it raises. The fact that race is never mentioned in the script also works well. There’s no reason why it would, in this case, when the focus is the effect of a family suicide that is not race based. As I got to know Renee Rodriquez, I wondered if she might want to approach the claustrophobic suburban world in which Rope of Sands exists with a mixed race cast, but I assumed Meredith would be the character with dark skin. Renee turned the tables on me by making Meredith white, with all the ironies that choice brings, and the beauty of the casting illustrates that an unconscious bias can appear in any form. Frustration is a good dramatic driver for me and frustration is the underlying emotion that drives Rope of Sands. It’s the frustration of people who desperately want and need to connect with each other, but keep failing at it without realizing the role they play in sabotaging things. I’m thrilled that the feedback has been so enthusiastic and I’m very proud of this production. I’m also very moved at the seriousness and commitment with which everyone involved approached it. A playwright could not hope for more than to have their work treated with respect by the talented people tasked with interpreting it.